The first 2016 Euroconstruct Conference took place in Dublin/Ireland on 9 and 10 June 2016. 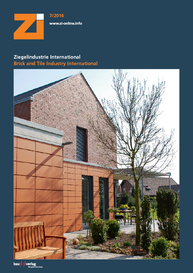 The conference is part of Euroconstruct’s bi-annual series on European construction markets. 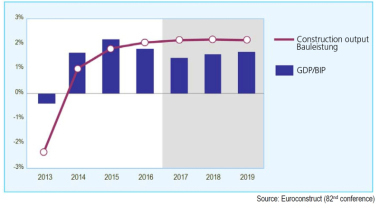 Beside publishing new European economic and construction market forecasts, the 81st conference centred on the theme of “European Construction Prospects in a Low Interest Rate Environment”. It is estimated that GDP will grow by 1.9 % per annum for the 19 Euroconstruct countries in the three years 2016-2018, which is virtually unchanged from last December (Budapest) forecasts. The year 2016 will see the GDP of the 19 member countries grow by 1.8 %, a forecast which is slightly below the 2 % projected in December 2015, while growth of 1.9 % is foreseen for 2017. Notably, the year 2015 was the first time in eight years that all E­uroconstruct countries recorded an increase in GDP, a development which is expected to continue over the next three years. 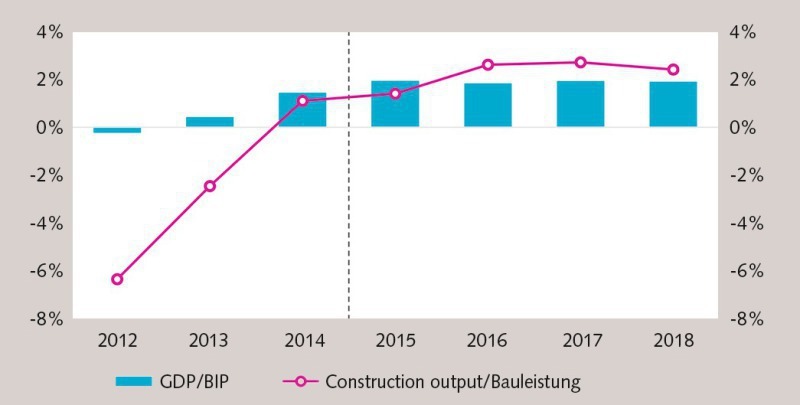 Growth in total construction output for both 2014 and 2015 have been revised downwards from the Budapest projections, as 2014 saw output increase by 1.1 % (as opposed to 1.3 %), while 2015 saw growth of 1.4 % (as opposed to 1.6 %). The overall value of the construction industry itself is estimated to be € 1.406 billion in 2016. This equates to 9.4 % of GDP and is significantly lower than the peak of 2007, where the industry accounted for 13 % of GDP. 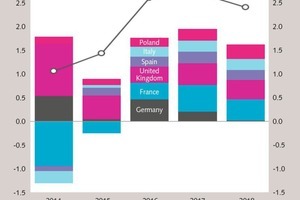 Although the Euroconstruct market did stabilize in 2015, a diverse range of growth rates were recorded across the 19 member countries during the year. Strong output growth rates were noted in the Slovak Republic (+18.5 %), the Netherlands (+7.8 %) and the Czech Republic (+7.1 %), while countries such as Austria, France and Switzerland, contracted marginally in 2015. € 36.5 billion. 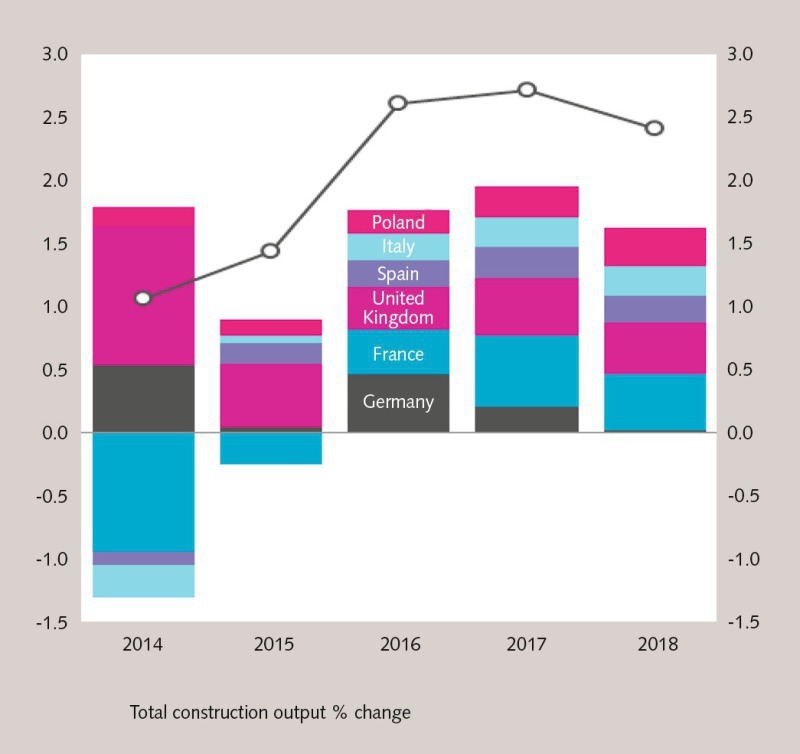 For 2016, the six largest construction markets1 are expected to contribute almost three-quarters of this growth in the Euroconstruct market, highlighting their importance to the market. The smallest contributions for growth in 2016 can be credited to the Slovak Republic, Hungary, Austria and the Czech Republic, which between them only contribute 2.2 % of the total increase of € 36.5 billion for 2016. 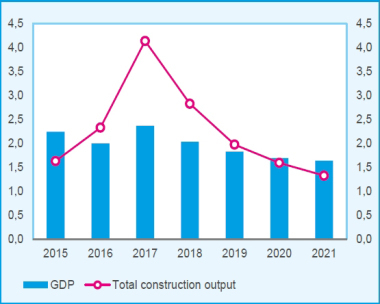 From a domestic point of view, Ireland’s construction industry is predicted to experience exceptional cumulative growth of 42.5 % in the next three years, albeit from an exceptionally low base. The 82nd Euroconstruct Conference focusing on the European construction prospects to 2019 will take place in Barcelona, Spain from 24 to 25 November 2016.